The blog posts this week have raised a series of questions about energy security. Conventional political thinking on energy security has a narrow focus which emphasises the need to secure state energy supplies. Sustainability is largely ignored, as short-term economic benefit is continually prioritised. The political and military survival of states is prioritised over environmental or climate stability, and human security. So what is to be done? Discussions of energy security are slowly beginning to notice the need to factor in climate impacts in economic and human net-benefit calculations, with the IEA releasing a special report in 2013 to map out what can be done. Improving energy efficiency is central, as is continued and increased investment in renewable energy. Some present nuclear energy or clean coal technologies as part of the solution, but a recent study by Mark Jacobson examined solutions to global warming, air pollution and energy security and took the three as linked, and he found that clean coal technologies and nuclear investments provided ‘less benefit with greater negative impacts’. The conclusion of the study stated that ‘because sufficient clean natural resources (e.g. , wind, sunlight, hot water, ocean energy, gravitational energy) exists to power all energy for the world…the diversion of attention to the less efficient or non-efficient options represents an opportunity cost that delays solutions to climate and air pollution health problems’. Organisations like Greenpeace and Friends of the Earth have also produced extensive reports outlining alternative policy solutions to enable the world to move away from fossil fuels towards a sustainable future. Whichever solution is suggested, it is likely to require a serious change in thinking on behalf of political leaders. Economist Tim Jackson suggests that rethinking notions of prosperity and growth are central to solving the issue. To minimise permanent or long-term climate and ecosystem damage, it is clear that sustainability needs to be prioritised over short-term economic gain. The truth is that we simply do not know the extent of the damage we have already caused the planet, and to save the future of humanity, any further damage needs to be avoided. It is clear that energy security opens up some difficult questions about what or whose security should be prioritised. At the centre of this is the growing conflict between the focus of much energy security policy and discussion on fossil fuels, and the human need for a stable climate and environment. Energy security as currently understood by most policymakers is incompatible with a stable climate. We see perhaps the biggest conflict between energy and climate security today in China. As recognised by the International Energy Agency, burning fossil fuels for energy is by far the central source of anthropogenic greenhouse gas emissions. If climate change and air pollution are also considered, fossil fuels ultimately no longer provide security. China’s rapid economic development has led to a huge growth in its demand for energy. It still relies largely on domestic resources, which makes it ‘secure’ if you equate energy independence with energy security. However, nearly 70 percent of China’s energy comes from coal – which is both cheap and domestically available. Coal is by far the dirtiest source of energy, and contributes more to global warming than any other fossil fuel. 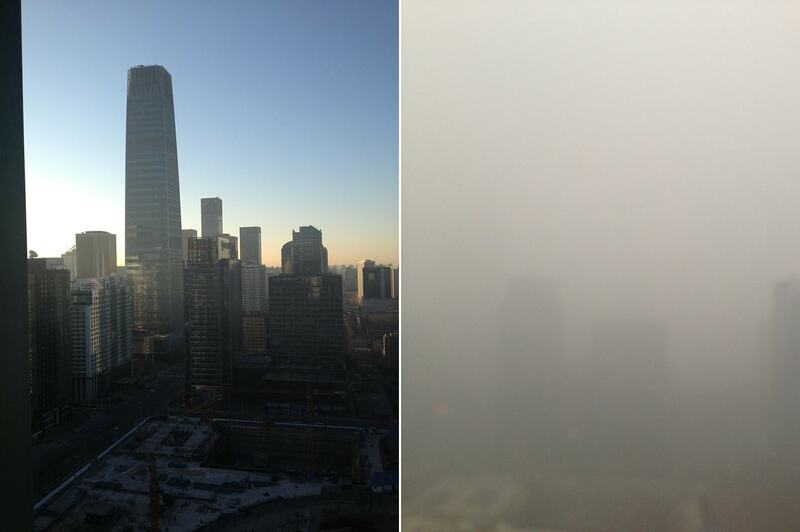 China’s air pollution problems became world news last winter, when the air quality hit new lows. The US embassy in Beijing has been measuring air quality since 2008, and publishing the data on a twitter account using a pollution measurement scale from the US Environmental Protection Agency. The air quality index suggests measurements between 101 and 150 are unhealthy for ‘sensitive groups’, meaning children, the elderly and those suffering from asthma. For pollution levels between 301 and 500, labelled ‘hazardous’, they recommend everyone to refrain from doing any physical activity outdoors. Last winter, readings reached 755 – on a scale that stops at 500. The ongoing ‘trend’ has been labelled an ‘airpocalypse’, with high levels of pollution linked to increased levels of some types of cancer, as well as respiratory illnesses. Air pollution is also a cause of acid rain, which contaminates food supplies and damages ecosystems. Air and water pollution has been linked to a new phenomenon of ‘cancer villages’ in parts of China, where inhabitants suffer unusually high rates of cancer. Unsurprisingly, people are increasingly unhappy about the social and environmental costs of development, and the number of environmental protests in China is rising. The government is attempting to tackle the issue, but growing energy demand means that a reduction in coal use is unlikely to happen even in the next decade. The growing conflict between increasing energy demand to support economic development and environmental stability is going to be one of the biggest challenges for China in the next decade. The government has repeatedly stated that economic development does not have to be unsustainable, but it is yet to back this up with serious action. While the situation in China is at the centre of this debate, the rest of the world has also failed to come up with a clear solution. Existing approaches to energy security still largely overlook the impact policy choices have on the climate or the environment. Some argue that the environment or the climate are not ‘security’ issues, and while I personally disagree, whichever position you take it is clear that these are issues increasingly affecting the lives and livelihoods of human beings. The question we seem to be left with is: do we have to choose between energy security and a stable climate? Is it possible to ‘have it all’?